TECOLOTE: THE LITTLE HORSE THAT COULD click here to see a video of Sandy Nathan's new book about a premature Peruvian Paso colt. 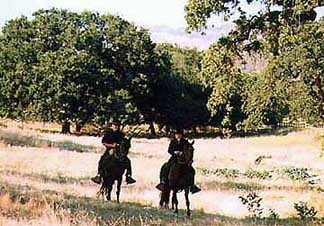 Rancho Vilasa owners Barry and Sandy Nathan ride their Peruvian Paso horses at Rancho Vilasa. Walk with us and see OUR FACILITIES. The Santa Ynez Valley is one of the most beautiful places we've ever seen. Join us as we HIT THE TRAILS and hang out around the ranch. Then, come back to the house & relax. We'll fill you in on THE NEWS from horseshows and elsewhere. Are you interested in the humane horse training? Check out THE TRAINING SERIES, a five part series of articles showing the basics of training and the first saddle of several of our mares. Mostly calm and poetic, but not without thrills. Like poetry, AZTECA is a poem Sandy Nathan wrote about a mystical experience on horseback. Horses and mystical experience go together. Have you heard the word brio? Brio, which means willingness to please the rider, is a characteristinc of Peruvian Paso horses. It can also be translated as "spirit" or enthusiasm. THE DEFINITION OF BRIO shows you what it means as the new owner of one of the horses we've bred rides her horse. 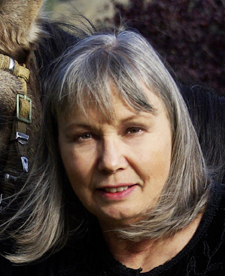 SANDY NATHAN: Captivated by Horses, shares Sandy's fifty-five year history with horses. It's a testimonial to the value of a life filled with horsesall illustrated with great photos. Into dogs? Oh, just go to Sandy's Official Web Site and click on the For the Love of Dogs tab. While you're here, enjoy our on-line magazine and art gallery. SPURS MAGAZINE is dedicated to "having things turn out right". It provides that motivating, uplifting factor that we need in this trying world. SPURS contains short stories, essays, photographs, paintings, and poetry. Some are horse related; others are not. Be prepared to laughand cry. VILASA PRESS is our latest endeavor. At Vilasa Press, we produce books to amaze and delight, provoke thought and ethical action. We have produced four books. All have won national awards. Click on the book covers below to find out more. Click the covers above to go Sandy Nathan's books on the Amazon Kindle store. All Kindle books are 99 cents. They are also available as print books at Amazon..The Angel and Numenon are also at the Nook store. The Angel is an iBook, as well.